A classy Villeret watch with retrograde days, big date and a welcome touch of eccentricity. 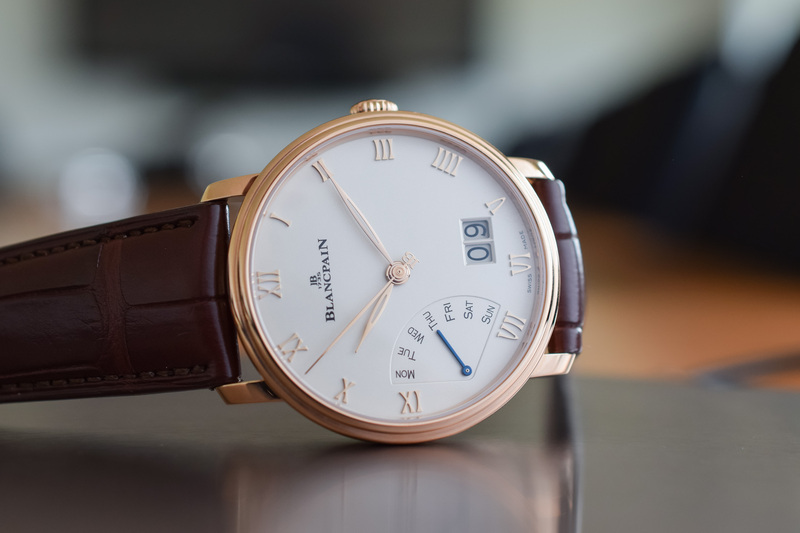 Blancpain’s Villeret collection welcomes the 40mm Grande Date Jour Retrograde on board. Very much in line with the understated, classic tone of the Villeret family, this new Villeret watch features a novel retrograde day of the week indication paired with a big date displayed in two windows. Unveiled at Baselworld 2018, along with a Villeret tourbillon and jumping minutes and a complete calendar with GMT functions, the Villeret knows how to take on complications in style. 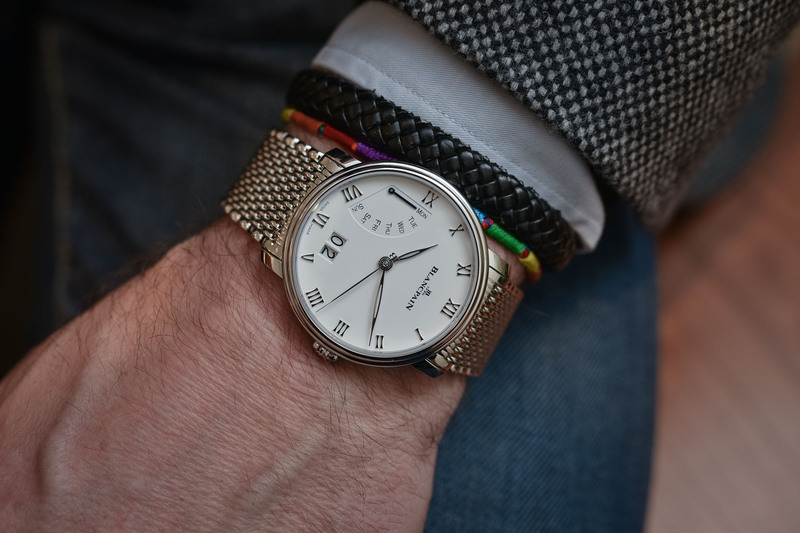 Let’s take a closer look at the 40mm stainless steel model and why little design details can go a long way in giving a classic watch a dash of luxury and character. 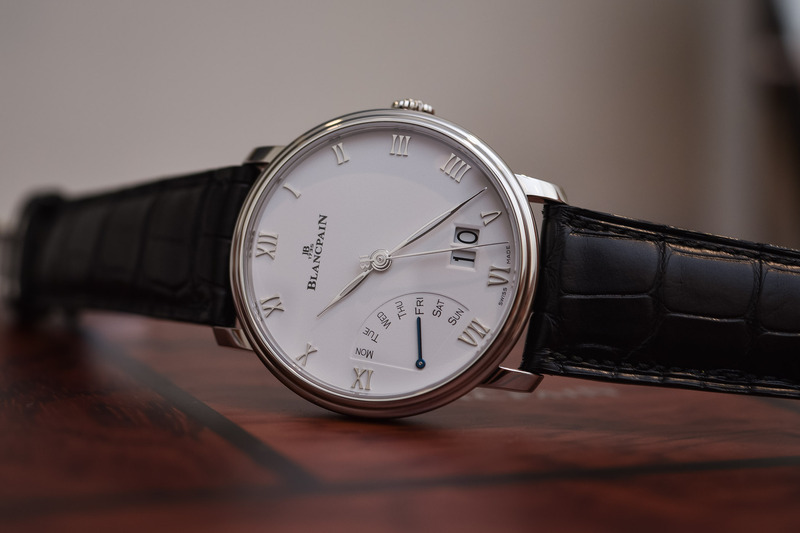 Named after the village in the Joux Valley where Jehan-Jacques Blancpain set up his workshop on the top floor of his house in 1735, the Villeret family of watches is Blancpain’s ambassador of timeless elegance. As one of the oldest watch manufactures in the Vallée de Joux, the past plays a weighty role in the aesthetics of the Villeret collection marked by pure lines, clear dials and elegant profiles. Like all Villeret watches, the case of the Grande Date Jour Retrograde features the hallmark Villeret double stepped bezel, a design device that visually attenuates and slims down the case height of 11.10mm, while the sloping lugs help to mitigate the diameter of the case on the wrist. Another interesting feature is the incorporation of the invisible under-lug correctors. 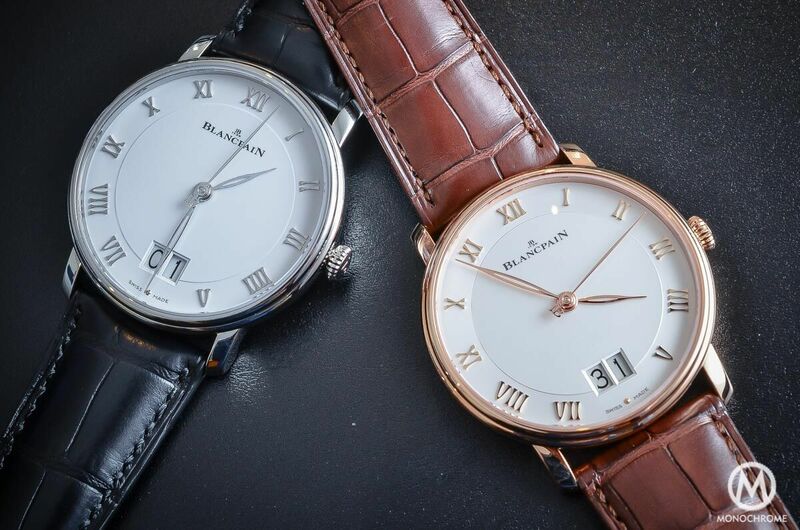 Patented by Blancpain and first introduced in 2005, these unobtrusive correctors are hidden under the lugs and let you adjust the day of the week with your fingertip. This ingenious mechanism avoids the use of fiddly pushers or tools and the ugly presence of dimples or micro-pushers located on the sides of the case. The new Villeret Grande Date Hour Retrograde is a thoroughbred Villeret family member, with an engaging twist. 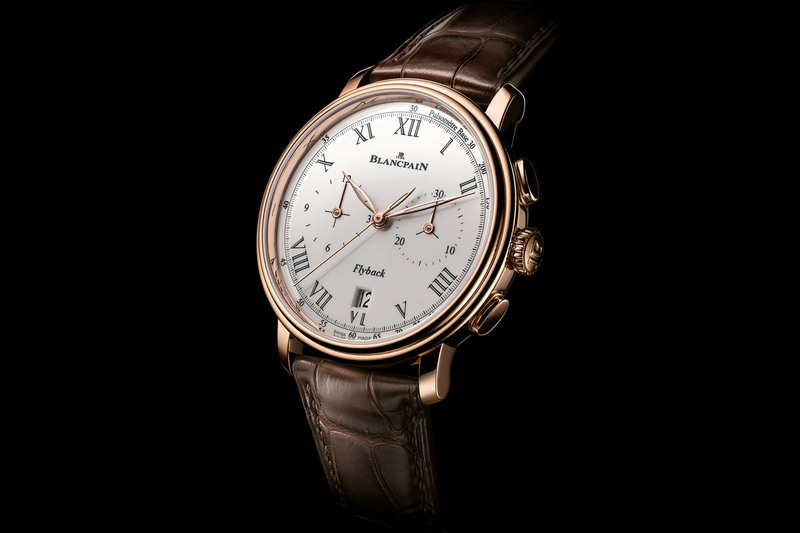 The incorporation of the retrograde day of the week function, placed in a fan-shaped aperture between 7 and 9 o’clock, disrupts the placid harmony and conservatism of the dial. Coupled with the slightly off-centred big date display in two windows between 5 and 6 o’clock, the asymmetry on the dial adds character and interest to the watch. This is not a date window that is lurking in the shadows, but a confident generous date window designed to let you actually read the date in question. The crisp white opaline dial is practically monochromatic, save for the blue retrograde day hand and the black logo and date numerals. 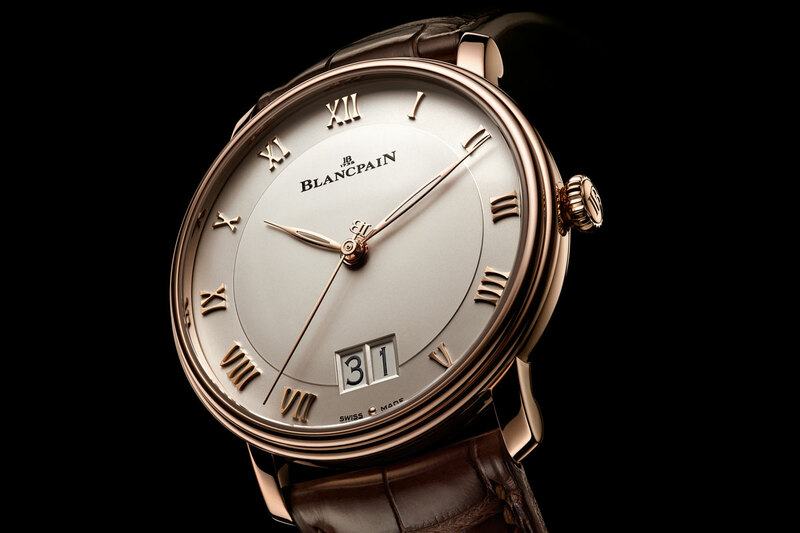 The applied Roman numerals, made in Blancpain’s dedicated Villeret font, consolidate the classicism of the watch but are offset by the skeletonised leaf-shaped hands bringing a touch of modernity to the whole. 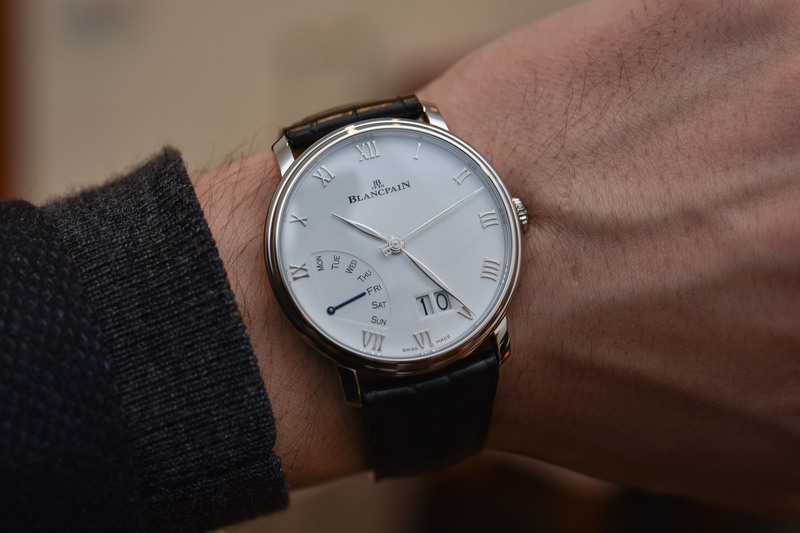 The elongated central seconds hand features Blancpain’s initials on the counterweight – a detail I had to search for on the internet because I couldn’t work out who or what the IB letters on the counterweight were referring to. 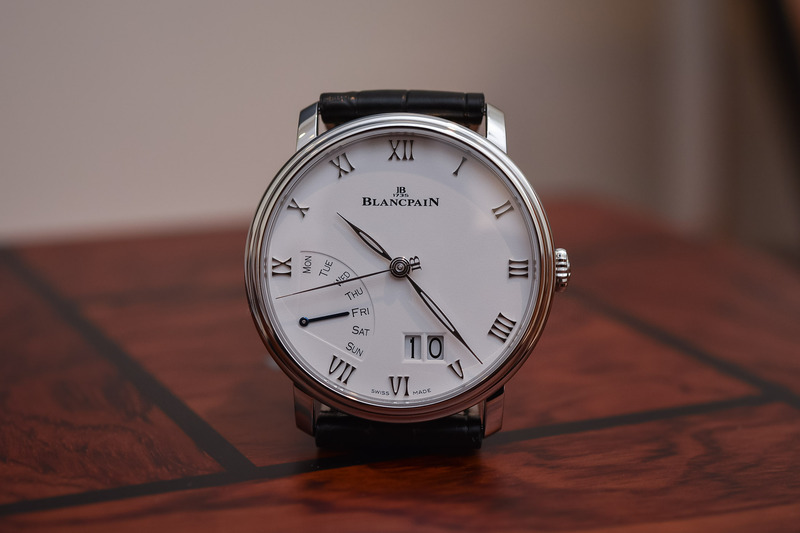 Apparently, it is not an ‘I’ but a ‘J’ before the ‘B’ and refers to the initials of the founding father of Blancpain, Jehan-Jacques Blancpain. 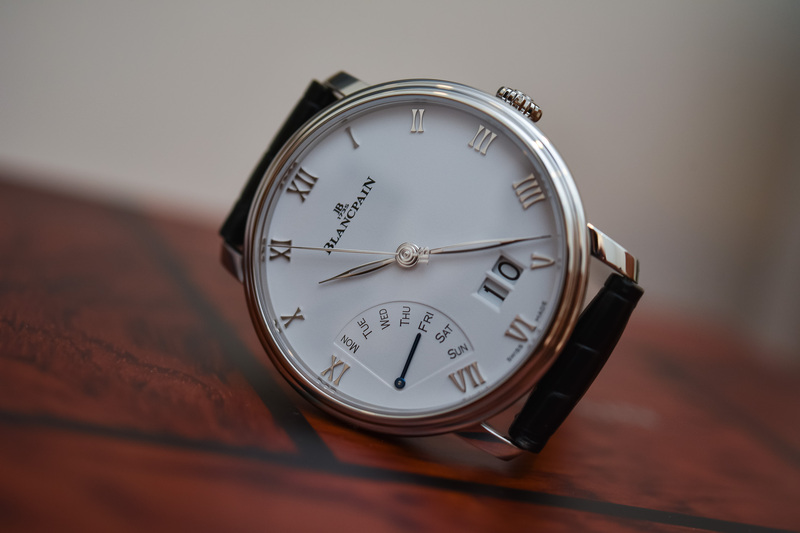 Personally, I could do without the initials dangling at the end of the seconds hand, a questionable design choice that is also used on Glashütte Original’s Senator watch. Yet, this is a personal opinion and some will probably like it. Both the big date function and the day of the week change instantly at midnight and the blue hand performs a self-assured retrograde motion on Sunday to start the week again on Monday. 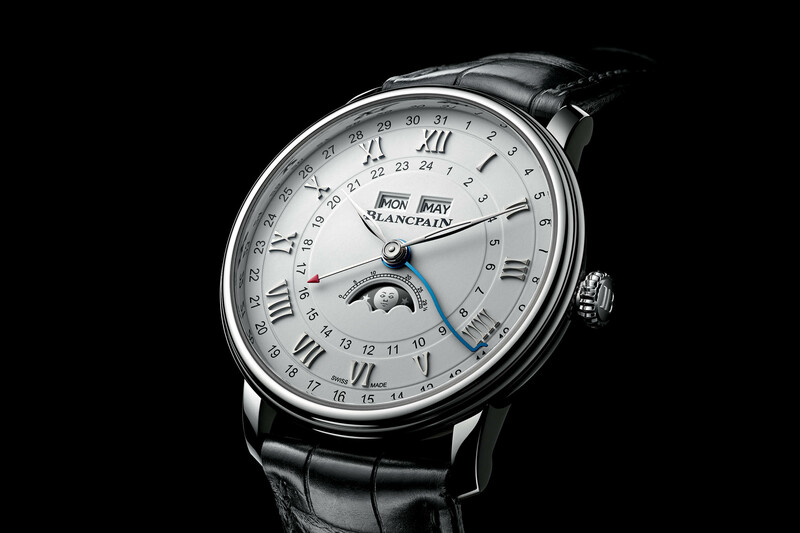 Powering the complications is Blancpain’s new 6950GJ in-house movement based on calibre 1150. 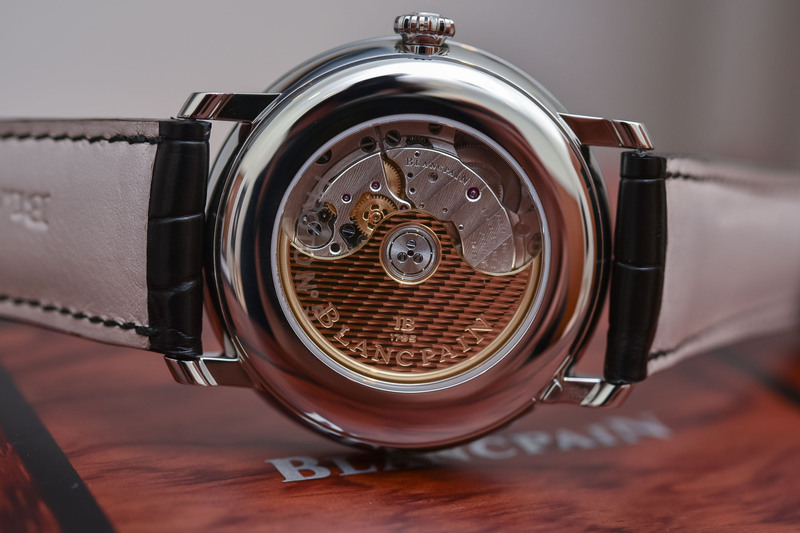 Fitted with two mainspring barrels, the movement offers a respectable power reserve of 72 hours and the fine finishings can be viewed through the clear case back. The gold rotor features an elegant honeycomb guilloché motif and the bridges are decorated with Geneva stripes. Available in steel and a luxurious 18k red gold edition (also on leather strap or on gold bracelet), the steel model we have been looking at today comes with two strap options for two very different looks: a classic black alligator leather strap for a dressier look and a practical and sportier Milanese mesh steel bracelet. Given the two, I would definitely go with the steel bracelet to downplay its traditional character and highlight its eccentricities. 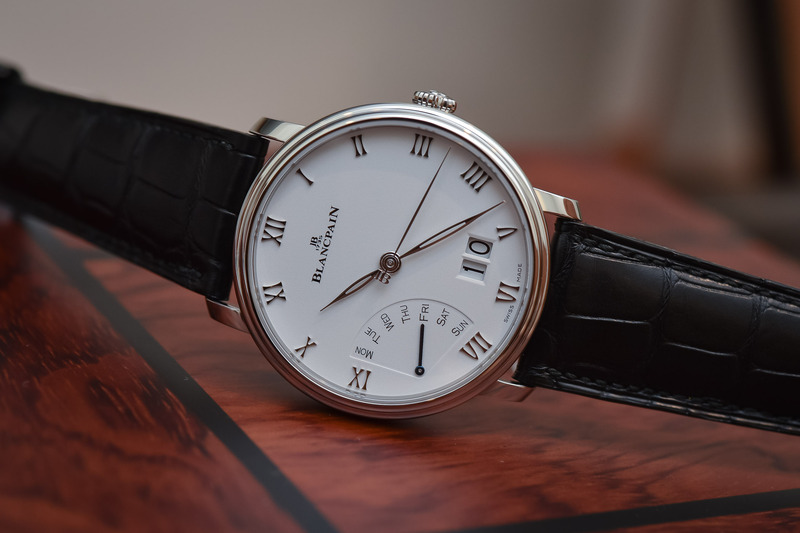 The Villeret Grande Date Jour Rétrograde in steel on a leather strap retails for EUR 12,770. 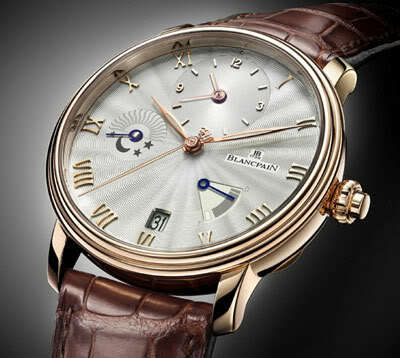 For more details, please consult www.blancpain.com. I’m normally a great fan of asymmetry [Breguet are the champions! ], but this dial is dire. I love the dial, and find this watch sophisticated and interesting, though too big. The blue retrograde hand seems a bit out of place but I love the complication and would love to see what this looks like on my wrist.